When the N.B.A.’s Philadelphia 76ers were sold in 2011, a group of private equity investors bought the team for $280 million. When the Memphis Grizzlies were sold in 2012, a 34-year-old wireless technology entrepreneur paid $377 million. This month, two hedge fund billionaires shelled out $550 million for the lowly Milwaukee Bucks. And then there is Donald Sterling, the former divorce lawyer who bought the Clippers for $12.7 million some 33 years ago and now finds himself at the center of swirling debate over racist remarks. Mr. Sterling is part of the old guard of N.B.A. owners, a group of men who bought teams before the league became a global phenomenon worth billions of dollars. Three decades ago, a successful local businessman interested in a team as an extravagant plaything could join the elite club of N.B.A. owners; today, the teams are within reach of few outside billionaire hedge fund managers, tech moguls and Russian oligarchs. For an example of the new, morally superior type of owner that the NBA has been welcoming, consider Mikhail Prokhorov, during the Yeltsin era, right hand man to Vladimir Potanin, one of the Seven Oligarchs. Prokhorov bought the New Jersey Nets a few years ago on condition of being allowed to move them to the gleaming new stadium in gentrifying Brooklyn. Mikhail Dmitrievitch Prokhorov (Russian: ??????? ??????????? ????????? ; born 3 May 1965) is a Russian billionaire, politician, and owner of the American basketball team the Brooklyn Nets. After graduating from the Moscow Finance Institute, he worked in the financial sector and subsequently went on to become one of Russia's leading industrialists, owning major stakes in multinational corporations in the precious metals sector. While he was running Norilsk Nickel, the company became the world's largest producer of nickel and palladium. He is the former chairman of Polyus Gold, Russia's largest gold producer, and the former President of ONEXIM Group. He resigned both positions to enter politics in June 2011. In 1992, at the age of 27, Prokhorov partnered with Potanin to run Interros, a holding company that they used in 1995 to effect the purchase of Norilsk Nickel, one of Russia's largest nickel and palladium mining and smelting companies. During the largely un-regulated privatization of former state-controlled industries after the collapse of the USSR, Prokhorov and Potanin (the latter by then a deputy prime minister who oversaw privatization) were able acquire the shares from the workers of Norilsk Nickel for a fraction of their estimated market value and seize ownership of the company. When he departed in 2007, Prokhorov's share of the company was worth US $7.5 billion. ... In the 1990s, the Russian government needed loans to operate. Prokhorov partnered with Potanin. Their Onexim bank ran auctions for the government, in which bidders won the right to loan the Russian government money. Onexim and its affiliates were the winning bidders at the Norlisk Nickel and other auctions they conducted. The Russian government secured the loans with blocks of shares of the newly privatized state enterprises. The government never repaid the loans, and, as a result, Onexim received ownership of the collateral, which was the shares in the privatized enterprises. When cash privatization eventually replaced the failing voucher privatization phase, the government came up with a scheme to leverage the privatization process and quickly raise money for its cash-strapped operations. Under the "loans for shares" program, the administration sold off majority stakes in some of its prized companies in the energy, telecommunications, and metallurgical sectors in exchange for loans taken from the new private sector banks owned by rich businessmen. According to the terms of the loan, the lender could stake equity ownership in the company if the government failed to repay the loans by September 1996. Auctions conducted under the "loans for shares" program were executed in such a way that only the few businessmen who owned these banks were allowed to partake in auctions. Following these bogus auctions, the majority stakes in some of the biggest Russian companies were acquired by a small number of major banks at abysmally low prices. These businessmen also bankrolled Yeltsin's 1996 presidential election victory, exerting their influence over the then president. In April 1996, Prokhorov was appointed to the Board of Directors of Norilsk Nickel (which then still belonged to the state). In November 1995, Onexim Bank won 38 percent of Norilsk Nickel in a loans-for-shares auction for US$170.1 million, a mere US$100,000 or less than a fraction of a fraction of 1% higher than the bid starting price. At the time, Norilsk produced 25% of the world's nickel output. Onexim managed the Norilsk Nickel auction, with a reservation price of US$170 million. It arranged three bids from affiliates, all at US$170 or US$170.1 million. Rossiiski Kredit Bank offered US$355 million, more than twice the starting amount. However, Onexim disqualified Rossiiski Kredit's bid on the basis that the bid amount exceeded Rossiiski Kredit's charter capital (the nominal value of its outstanding shares). Ironically, when Onexim allows its own affiliate to win the bidding at US$170.1 million, that amount also exceeded the affiliate's charter capital. The auction rules required Onexim to provide any objections in advance of the auction, to give bidders time to cure them. None of the submitted bids even closely approximated the market value of Norilsk Nickel, which had annual profits of around US$400 million. Kremlin leaders gave him what amounts to an insiders opportunity to buy one of the state's most valuable assets. It was acquired from the Kremlin in a so-called auction for the measly sum of a few hundred million dollars in a process that even Prokhorov's business partner admits wasn't perfect, and probably not even legal under Western standards. But it was legal in Russia". During the interview, Russian business correspondent Julia Latnina stated about the auction of Norlisk Nickel, "Yes, it was rigged. But, it cannot be explained in normal economic terms to an outsider, especially an American. You had robber barons, we have oligarchs." In September 2009, he made an offer to buy a controlling interest in the New Jersey Nets of the National Basketball Association and half of a project to build a new arena in Brooklyn. On 11 May 2010, the NBA approved the sale of the Nets to Prokhorov, making him the majority owner of the team with an 80% stake. He also acquired a 45% interest in the new Barclays Center sports and entertainment arena. He became the first non-North American team owner in the NBA and also the tallest, standing at 6?8?. In December 2011, after announcing his run for the Russian presidency, the NBA confirmed that Prokhorov's ownership interest would not need to be altered in the event of his election (Herb Kohl, a then sitting but since retired U.S. Senator, owns the Milwaukee Bucks). 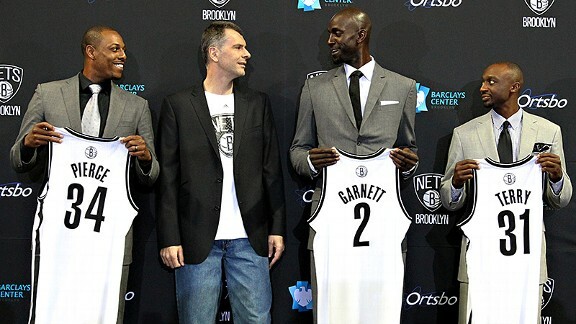 On 30 April 2012, the Nets officially made the move to Brooklyn, rebranding themselves as the Brooklyn Nets. At a Christmas party for the Russian nouveau riche at the French Alpine resort of Courchevel in January 2007, he was arrested on suspicion of arranging prostitutes for his guests. Regarding Prokhorov's political efforts and the Right Cause party, critical commentators claim that the entire endeavor is just a project of the Kremlin closely curated by Vladislav Surkov and that Prokorov was effectively appointed to be the party leader rather than being chosen by independently minded party members. According to them, the "puppet party" was designed to divert opposition voters by using liberal rhetoric. In December 2011, after the legislative elections, Prokhorov announced that he would contest the 2012 presidential election against Vladimir Putin as an independent. He called it at the time "probably the most important decision of my life". Communist leader Gennady Zyuganov and opposition leader Boris Nemtsov both saw the move as an attempt "to preserve Putin's regime". In the 4 March 2012 presidential polling, Prokhorov gained 7.94% of the vote. The dispossession of Sterling will clear the way for the NBA to ethically upgrade its owners to the high standards set by this man of such sterling character that he has managed to have a solid working relationship with both Boris Yeltsin and Vladimir Putin.